The MISCO PA202X-400-005 Palm Abbe Digital Fluid Refractometer features 2 aircraft deicing and anti-icing fluid testing measurement scales – Refractive Index and Brix Propylene Glycol Temperature Compensation. The Refractive Index scale measures the speed of light through the medium and compares this to the speed of light through air or a vacuum, generating a measurement ratio. The Brix scale measures aircraft deicing/anti-icing fluid sugar concentration (% sugar weight/weight) up to 60 degrees Brix. The PA202X-400-005 Brix scale is extremely accurate unit with with low error tolerances: 0.1% Resolution, +/-0.1% Precision. All MISCO Palm Abbe Refractometers can be calibrated to utilize Fahrenheit or Celsius temperature references when automatically calculating temperature compensation. The new Palm Abbe is a fourth-generation digital handheld refractometer that puts laboratory precision in the palm of your hand. Not just laboratory precision, but laboratory precision for the price of a traditional analog refractometer that is optimally designed for use in the field. It is exactly the kind of bold, cutting-edge technology you would expect from MISCO, the company that pioneered the digital handheld refractometer. 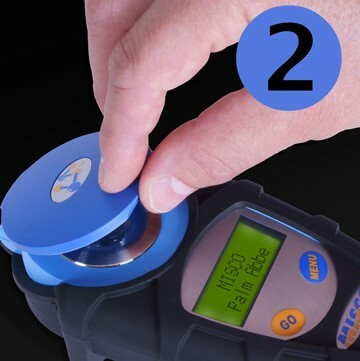 The Palm Abbe refractometer is fast, convenient, and stress-free. 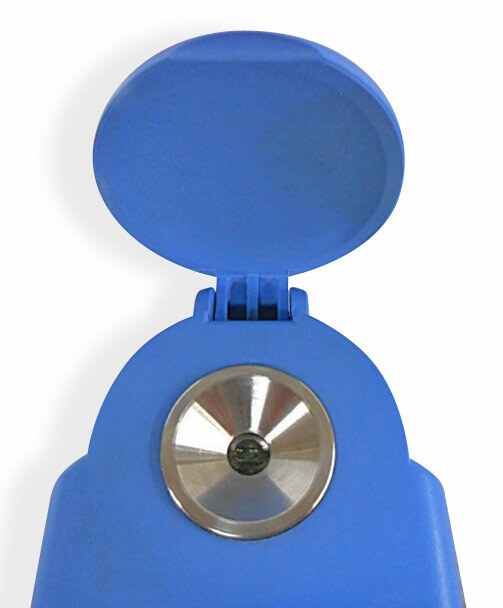 Simply place a drop or two of fluid in the stainless-steel sample well and press a button. The custom-designed microprocessor delivers a nearly instantaneous readout. Comprised of a light source, optics and measurement electronics, the nearly indestructible Sapphire Optical Engine calculates the precise fluid measurements for you. The nonlinear temperature compensation is automatic, ensuring that fluids reading between 0 and 50 °C (+32 to 122 °F) are measured accurately. 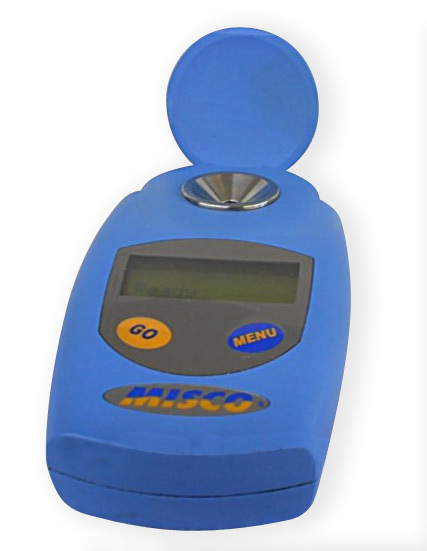 Despite being highly sophisticated, Palm Abbe refractometers are easy to use with very little training. 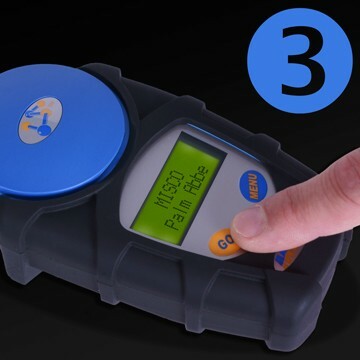 The large 24-character 2-line backlit LCD display is easily read, even in dim light, and removes the subjectivity associated with interpreting where a boundary line crosses tiny scale divisions. And, it is so easy to use! The user interface consists of two buttons, one to take readings and the other to step through various menu options. 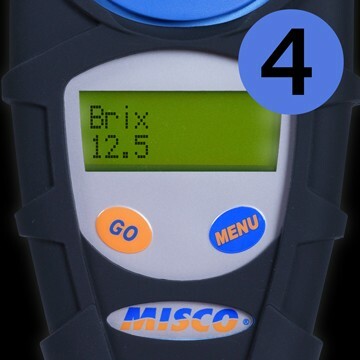 All MISCO PA202X fluid refractometers operate on three (3) AAA batteries and have a 5,000+ reading battery life. 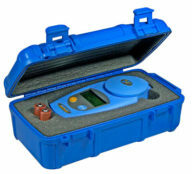 Calibration is automatic and does not require the use of special calibration solutions, or tools. The Palm Abbe refractometer automatically calibrates itself to water and is ready to use in seconds. No more screws to turn and nothing to adjust. Calibration certificates are available are available with the purchase of new MISCO refractometers for an additional $30. Simply add the calibration certificate to your cart when ordering a refractometer. Laboratory testing is available for Type IV aircraft anti-icing fluids when complex fluid measurement precision is required. Please contact AERO Specialties for more information. The Palm Abbe refractometer has a wider range and twice the accuracy of the Pal-1. Compare the Palm Abbe to refractometers costing more than $1,000. 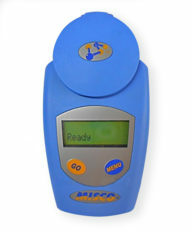 Digital refractometers remove the subjectivity associated with reading traditional refractometers. The Palm Abbe features non-linear temperature compensation that accurately compensates for fluid temperatures regardless or temperature or concentration. The Palm Abbe is built from high-impact, chemically resistant plastic. It is very water-resistant and designed to operate in the most demanding industrial environments. The Palm Abbe PA202 may be custom programmed with two different scales. Select from hundreds of available scales. If you ever change your mind, send it back to us, and we'll have it reprogrammed for you. Whatever your application we have a scale that will measure the exact unit of measure you want. The accuracy of your measurement is always dependent on the quality of your instrument.